I would not describe myself as a patient person. As a matter of fact, most of my life I’ve borderline hated waiting. When I was little I enjoyed waking up super early. I remember some mornings I laid in bed about three seconds before springing out of bed with the feeling that I was missing out on something going on outside my room. There usually wasn’t much going on except the silence of everyone sleeping. I would play with our cats or start on a craft project, but inevitably my parents would wake up. They would tell me to go back to bed. I’d trod back to my room and wait until my family (and the sun) were up. The time I spent waiting seemed like the longest of my life; after all, there were cats to pet and projects to paint! Waiting is hard but necessary. I really did need more sleep to grow. While it's easy to think that the waiting is futile, especially when we think we have better things to do, it serves an important purpose. You can learn so much from seasons that seem pointless. Recently God has been teaching me just how much value waiting has. My first season of waiting started last fall. I had recently come home from a missions conference, and while I was already interested in missions, the conference gave me a sense of urgency. I was blessed by conversations with several missionaries who shared their passion with me. I knew that my next step was to submit a Project Timothy video, but I was waiting on the Lord to tell me where to go. In the months that followed, I did a lot more waiting with the process of submitting my video and finding out if I was going. In many ways, it was an uncertain season. I didn’t know where God wanted me to go, I didn't know if I would go, and a few times I questioned if doing missions was actually my calling. Looking back, I was like my seven-year-old self: lying awake, wide-eyed and not so patient. It was in this season that God taught me several important things like trusting Him, especially when I thought I had better things to do. I thought I was just waiting but the Lord was growing, preparing and teaching me. Waiting isn't futile when God has a purpose or lesson to impress upon us. From my experience, peaceful waiting is trusting God to lead you down the right path at the right time. Instead of desperately trying to figure out what God’s plan is, we can hold His hand in the dark and trust Him to take us where we need to be. My prayer often echoes Psalms 143:8, which says "Cause me to hear your loving kindness in the morning, for in you I do trust; Cause me to know which way I should walk; for I lift up my soul to you." When God leads us down twisty, curvy roads, we hang on tight. When life seems to be at a standstill we feel as if we have been left by ourselves in the middle of the road. What we know is that God hasn’t left us alone, He is preparing the way ahead of us. Even when what lies ahead is unclear God knows everything He has in store. It's often in the moments that we are wondering where God is that He is most at work. His timing is perfect; peaceful waiting submits to whatever the Lord's purpose. If you feel as if you have been left in the middle of the road, remember God is working in your waiting. Someday you will look back and be amazed at what He has done. There's a beautiful quote by Morgan Harper Nichols that says "As she waits for the future, she leans into the present, for there are truly beautiful things to be gathered here". Take time in your waiting to be present- you never know the lessons God will teach you. Yet again, I'm in a season of waiting on the Lord to tell me where He wants me to go. This time, however, I am confident in my calling and God’s sovereignty in His direction in my life. It's a peaceful season of waiting, and I'm excited to see what I'll learn this year. The time you spend praying, thinking and hoping is not for nothing. Go ahead and dream. Plan. Anticipate. Take time to learn what God wants to teach you. 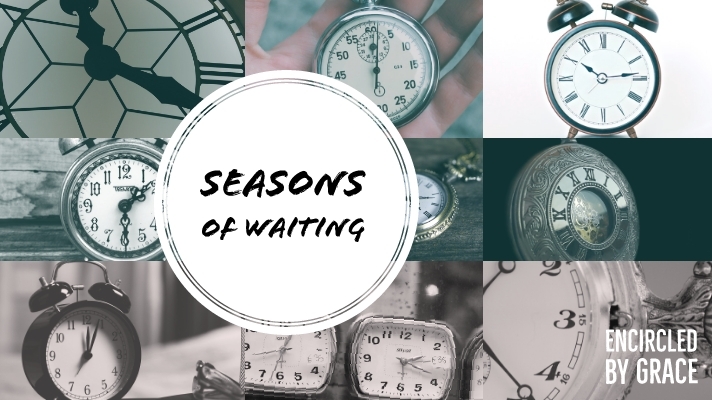 What do you do in seasons of waiting? Let me know in the comments!